The business readiness finder relies on metadata tags in search-api to filter content. Content is curated and added to a spreadsheet by the content team. Developer help is needed to upload the content. 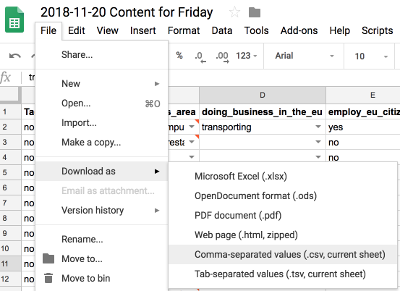 We do this by converting the spreadsheet into a CSV, including it in govuk-app-deployment-secrets and then releasing search-api. The process of converting the spreadsheet into a CSV involves removing a header row and converting windows encoded line breaks if present. There is a script to do this. Create a pull request and get it reviewed & merged. Re-deploy search-api and email-alert-api via Jenkins and the Release app. These requests often come in through Zendesk and for pages that have only been created that same day, so you may only be able to check this in production. If your commit includes some items being removed from the content spreadsheet then you should take a note of the base_paths for these items and once you have run the tag_metadata rake task in the above instructions, you should also run destroy_metadata_for_base_paths (e.g. on staging), passing in the base_paths that need removing. 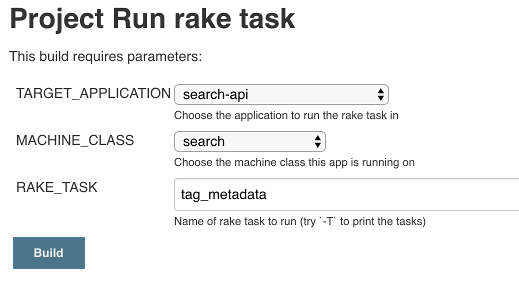 There are also other useful rake tasks. Remember to redeploy apps and re-run the tag_metadata task as above. Add the content id to the list of ordered related items for the business finder, within govuk-app-deployment-secrets. Despite the name, the order of the ordered_related_items does not matter. Re-deploy search-api via Jenkins and the Release app. Update the finder content by running the tag_metadata rake task in search-api to index the contents of the new CSV, it should take 2 to 3 minutes. Republish the finder so that the finder content item is updated. Pinned items rely on the finder-frontend content item which has a cache time of 5 mins and is independent of cachebusting. The same process as above applies for removing a pinned item: get the content item and remove it from the list within the ordered-related items. This page was last reviewed on 10 April 2019. It needs to be reviewed again on 10 July 2019 by the page owner #govuk-platform-health . This page was set to be reviewed before 10 July 2019 by the page owner #govuk-platform-health. This might mean the content is out of date.